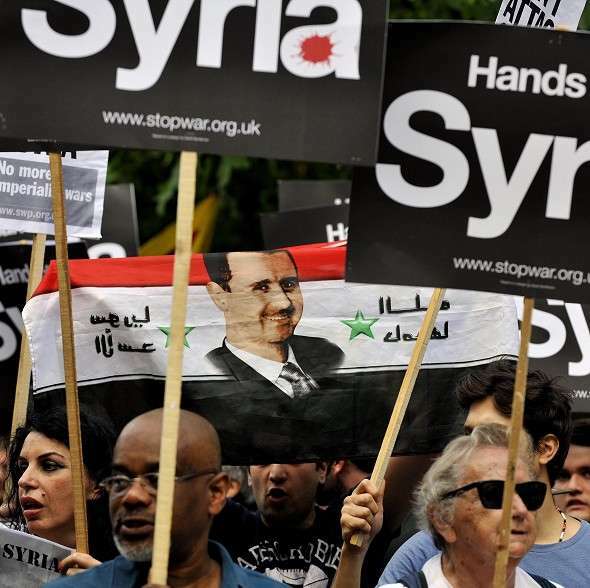 Leftist protesters carry pictures of Bashar al Assad at an “anti-war” march. Perhaps the most humorous aspect of the latest drivel published by Jacobin in defense of the Syrian regime headed by Bashar al-Assad is the way the “anti-imperialist” author is forced by their own tautological premise to downplay the decisive role that U.S. imperialism has played in defending what appears to be a leftist revolution (with, as always, flaws) currently taking place in Syrian Kurdistan. 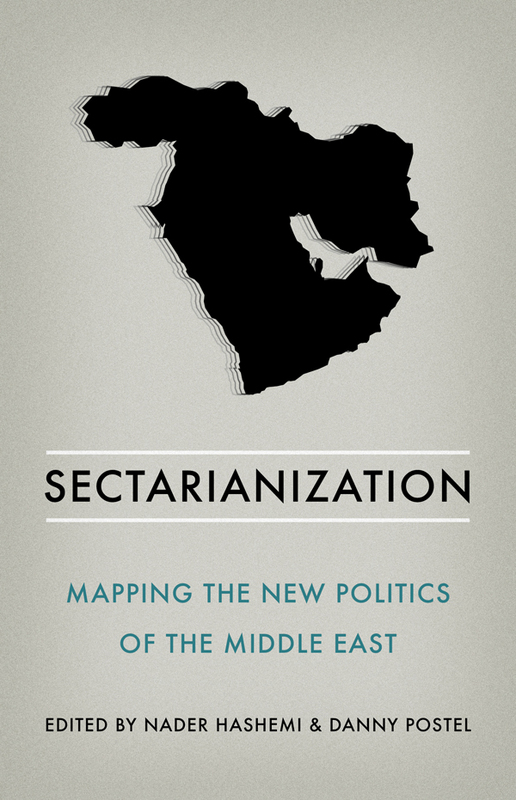 It’s understandable, to a degree: as one who also sympathizes with this seemingly left-libertarian project, which the author describes as a “spark of hope to many leftists in the West” – hope that is “not misplaced” – I too have been challenged by the fact that were it not for an extensive air campaign that the United States reluctantly carried out in Kobane, it might very well not exist. But while one can have doubts as to the ultimate wisdom of allying with a nation-state not known for its long-term friendships with left-wing radicals, one can’t deny that thus far that alliance has proved beneficial to the Democratic Union Party (PYD) and its militias, the all-men YPG and all-women YPJ. One can also acknowledge that while it might sully the beneficiaries’ anti-imperialist credentials to accept U.S. aid, those beneficiaries would say that in a world full of bad options they chose the least-bad one available, preferring it to genocide. What about those Kurds, though? No group in Syria has so benefited from U.S. imperialism; while the “Contras” of the Free Syrian Army have been forced to ration bullets, the PYD’s militias have suffered no such shortage, despite an embargo imposed by Iraq and Turkey. They are also only groups in Syria that are allowed to actually call-in U.S. air strikes. 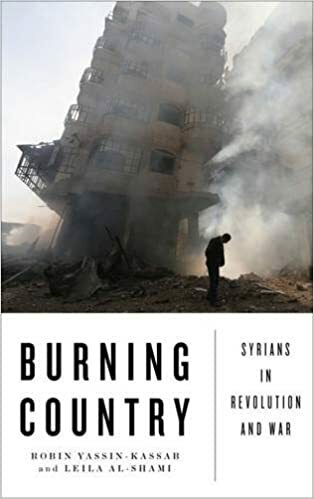 As Louis Proyect notes, were the FSA given such power the author would be “screaming bloody murder.” But the U.S. gives no such power to other groups in Syria: It has, in fact, bombed every other party involved in the Syrian conflict, from ISIS to Jabhat al-Nusra to a brigade aligned with the FSA – except, notably, the Syrian regime with which it has reportedly been coordinating its air strikes for the last year (the U.S. hasn’t even bombed the regime or any of its allied militias by “accident”). When it comes to an imperialist power aiding the PYD, Higgins is “remarkably patient,” writes Proyect – amusingly so (Russia’s imperial intervention predictably goes unmentioned). It’s more than just patience, though: it’s revisionism. Take the battle for Kobane, which was practically lost when the United States, aware of public relations, belatedly agreed to help the Kurds fight off the Islamic State. About this, the author writes: “The US, in addition to dropping bombs, dropped aid finding its way both into the hands of the People’s Protection Units (YPG), the fighting unit of the PYD, as well as ISIS.” The inconvenient reality elided here is that, “in addition to dropping bombs” that proved vital in the liberation of Kobane, the US provided lots of aid that more than just meandered its way to the Kurds and ISIS alike. ISIS did indeed claim to have seized one airdrop of arms, sure, but there were multiple drops every day, for months, that were received by the intended recipient: the anti-imperialist Kurds (the drops would “greatly help,” said a spokesperson for the YPG at the time, “and we thank America for this support”). 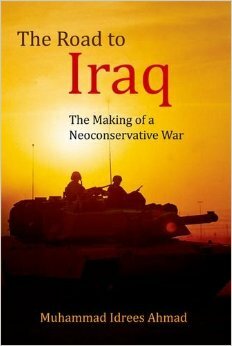 For the author to suggest parity is absurd – and, especially absurd for an anti-imperialist, diminishes the role imperialism has played in propping up a leftist project. The United States is not doing so because its president is the Marxist his conservative critics claim, but because it prefers the Kurds to ISIS the same way it preferred Ho Chi Minh to imperial Japan. Alliances of convenience may be less than ideal, Vietnam a lesson on the transient nature of an empire’s friendship, but even anti-imperialist militias must live in the world we have today. I too prefer it were it not so, but preferable to denial is acceptance of this reality, at least if we wish to ground our analysis – and proposed alternatives – in something approaching the truth. Rather than acknowledge U.S. imperialism’s role in propping up what’s billed as the last best hope for the left in Syria, the author distorts reality further: it’s the Syrian regime, in his telling, that has made Rojava possible. Indeed, “The space for this revolutionary project was created in opposition to” the rest of the Syrian opposition. There’s some truth to that: early on, there were battles between the YPG/YPJ and other armed opposition groups who suspected the Kurds had nationalist aspirations, not just a desire for autonomy. But that revolutionary space was also created by that opposition: Were it not for the uprising against the Assad regime, that regime never would have made the tactical decision to withdraw from Syrian Kurdistan, whose population it previously repressed (why not focus on more pressing targets and leave Turkey with what is sees as a problem on its border?). Notice, too, who the YPG thanked for saving Kobane: “the international coalition forces that have provided active support with airstrikes against ISIS,” as well as “Free Syrian Army groups” that continue to fight alongside it to this day. The Syrian regime, by contrast, came under both rhetorical and literal fire: As the Kurds were fighting ISIS, the “Baathist-fascist forces” of Bashar al-Assad – the YPG’s words – launched an attack on their purported friends, killing several militiamen. You won’t read about that in Jacobin, nor will you find any mention of the fact that the Syrian regime, not its opposition – “moderate” and “jihadist” alike – is responsible for the vast majority of the violence in Syria (you also won’t find much commentary on Syria from any Syrians, who are treated the way The Nation treats Palestinians when it comes to the debate over Israel). One can debate the merits of U.S. policy, and one can certainly oppose U.S. intervention anywhere and everywhere, but when facts pose a challenge to one’s anti-imperialism, it is better to grapple with them, not downplay or omit them. It’s unfortunate that a revolutionary project’s best friend at the moment, however fleetingly, is an imperialist power whose only interest is using revolutionaries as cannon fodder against ISIS, but that reality should lead those of us in the pampered West to undergo a long overdue project of our own: How can we express meaningful solidarity with leftists abroad who are coming under fire from secular and religious fascists alike? A candlelight vigil wouldn’t have saved Kobane. What we shouldn’t do is ignore facts that run counter to our ideological prejudices in the service of neat, simplistic narratives that treat some “U.S.-backed” rebels as more equal than others. Charles Davis is a writer and producer whose work has aired on TV and radio and been published by outlets such as Al Jazeera, The New Republic, Salon and Vice.